Germany kick off their quest to win their fourth European Championship when they take on Ukraine on Sunday night. Read below our Poland v Northern Ireland betting preview with the free predictions, betting tips, best odds, lineups, exclusive free bets and no deposit bonsues on Euro 2016. Germany marched through Euro 2016 qualifying with a 7-1-2 record to claim top spot in Group C but have struggled badly with consistency over the past year. Die Mannschaft have struggled in recent friendlies as they have lost four of their last nine matches, including games against Poland, England and the Republic of Ireland. Anyway, the World Champions recently posted a 4-1 win over Italy, and picked up a 2-0 victory in a pre-tournament date with Hungary. New Bayern Munich's signing Mats Hummels will miss the match and fellow defender Antonio Rudiger has been ruled out of the tournament after picking up an injury during training. Shkodran Mustafi is the likely partner for Jerome Boateng at the center of Germany’s defense. Joachim Low also has concerns at full-back, where Emre Can and Jonas Hector look set to start. Marco Reus' omission from the squad means Mario Gotze looks favourite to occupy the left forward role while Mario Gomez is expected to sparhead the attack in a 4-2-3-1 formation. Ukraine had a decent qualifying campaign, though finishing third in their group meant they had to overcome Slovenia in the play-offs to make it to France. They have won 10 of their last 16 matches in all competition and have shown exactly what they were capable of in the qualifying campaign by running Spain close twice. Furthermore, Ukraine have won all four of their friendly matches in 2016, 1-0 home wins over Cyprus and Wales in March and more recently they won 4-3 in Romania and 3-1 in Albania. Ukraine don't have any serious injury concerns and head coach Mykhaylo Fomenko, who caused a stir by omitting striker Evgen Seleznyov, is expected to field the strongest eleven. The 4-2-3-1 formation will see Zozulya as central forward, supported by Konoplyanka, Sydorchuk and Yarmolenko. Germany (4-2-3-1): Neuer – Hector, Mustafi, Boateng, Can – Khedira, Kroos – Gotze, Ozil, Muller – Gomez. Ukraine (4-2-3-1): Pyatov – Shevchuk, Khacheridi, Rakitskiy, Fedetskiy – Garmash, Stepanenko – Konoplyanka, Sydorchuk, Yarmolenko – Zozulya. 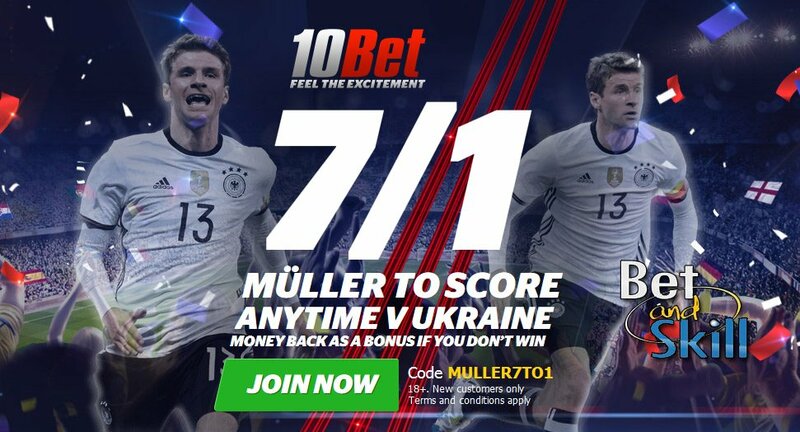 "Germany v Ukraine betting tips, predictions, lineups and free bets (Euro 2016 - Group C - 12.6.2016)"